Attn. 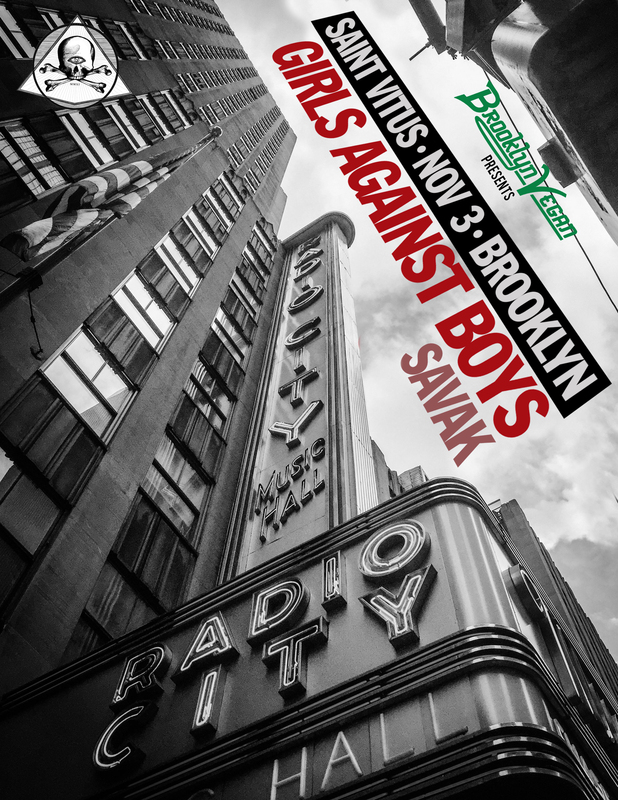 all rock’n’roll cattle, deer, antelopes, gazelles, goats, and sheep: Tomorrow night, 11/3/2016, at the tailbone of Greenpoint’s inverted cross, you will find SAVAK warming the Satanic bouncy castle known to humble locals and other immigrants as Saint Vitus. What makes this so special? Well, for starters, Girls Against Boys, once the sexiest band in America and now, at the very least, aggressively attractive, not-yet-octogenarian rockers, will be wiping the stage with our withered corpses around 10pm. That is to say, doors open at 8pm and we play at 9pm. Additionally, in an attempt to test the fate of friendship and drummer-ship, Alexis Fleisig (yes, the guy who takes cool pictures of buildings around our dented globe) will be keeping time for both groups. And if you think he can’t do it, come see for yourself. Also, clearly you didn’t see him steady the misaligned rowing of 4 (yes, four!) bands inside the moat of a castle in the Czech Republic. Next month, December, as some call it, we’re cruising across town to Shea Stadium (Did you see METZ there? Now *that* was a show!) to play with E and Operator Music Band. Are you down with E? If not, get to it, buddy. The name most likely associated with this new-ish Boston-area band is Thalia Zedek (Uzi, Live Skull, Come … zoinks! ), but that’s giving short shrift to Jason Sidney Sanford and Gavin McCarthy, who bring very specific musical points of view to the mix. Judging from some live clips on the world wide whatnot, it’s gonna be a steamer. 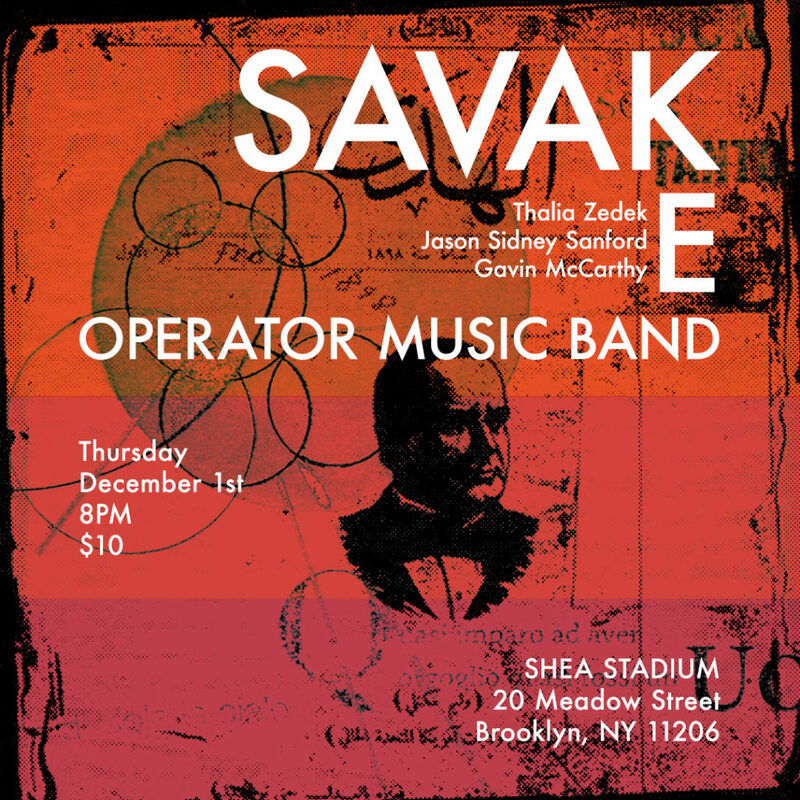 Operator Music Band we don’t know, but they claim to “skronk, wobbulate and motorize,” which we believe is akin to “shake a tail feather.” Come help us make it a grand ol’ time.